People’s Friend Special Magazine is published 17 times in a year with extra special short stories and other editorials like book recommendations, writer’s interviews and additional reading. Followed by £44.00 every 12 months by direct debit. This is a minimum 12 month term. 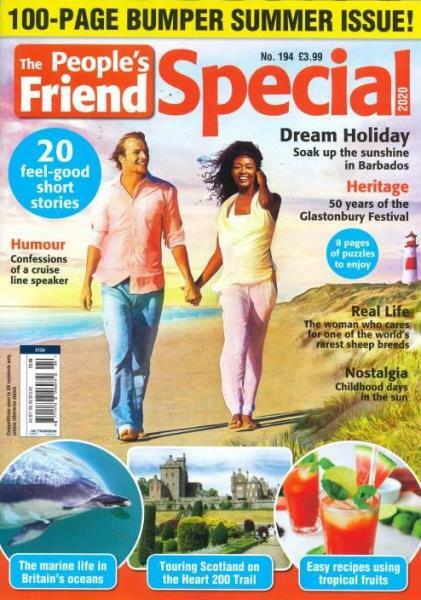 People’s Friend Special is a perfect companion to Peoples Friend magazine for fiction story lovers as the magazine is full of inspiring and feel good short stories that are brilliantly written with a tight story line and powerful narration. Apart from the short stories, the People’s Friend Special is packed with all the content a monthly reader could have desired for. The insightful interviews from the authors of the great books and stories provide an interesting read whereas the craft projects are motivating to try hands on your creativity and imagination. It likes to feature the special issues in accordance to the season and special occasions. The spring special issue may have some amazing gardening tips and the winter special issue may have some interesting knitting and stitching projects. You will have a splendid time with featured puzzles and poems that also make an important part of the People’s Friend Special magazine. Not only this but this magazine also have sumptuous treat of special seasonal recipes to be tried and loved by the entire family. I've enjoyed reading this for years but often miss the specials.